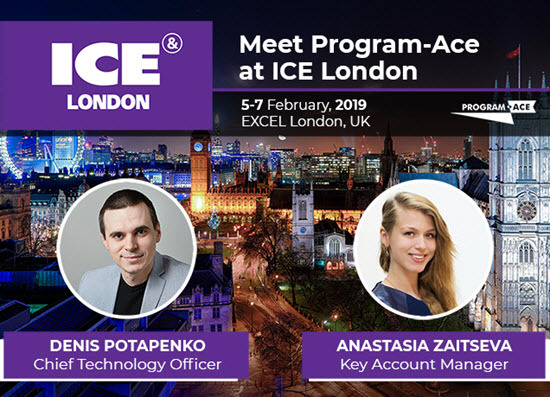 Program-Ace game development division Game-Ace is visiting ICE London, one of the biggest, if not the only one, B2B gaming events in the United Kingdom, on February 5-7, 2019. The event will take place at ExCel London, the exhibition and international convention center in Custom House, East London. ICE London is a learning and intelligence conference which aims to provide an opportunity for big companies and startups to engage with the latest gaming solutions. ICE London opens doors to world-class content and networking opportunities across all sectors of gaming. In 2018, ICE London Conference gathered over 33,000 attendees, 150 country representatives, and 8,500 operators. According to ICE London 2018 statistics, 80% of attendees showed interested in attending the conference again. Being a game development company with over 25 years of experience, Program-Ace is excited to visit such a gigantic conference. The company would be glad to share our experience in the field of full-cycle slot machines, social and instant, hyper-casual and casual game development. The number of 30,000+ decision-makers is an incredible opportunity to meet prospective partners and clients who can be interested in company services, as well as learn more about the latest gaming trends and technology, and spread the word about our company within a gaming business environment.